note: To set up Email Reports, see this doc: How do I set up Email Reports? You love all the data Lucky Orange provides you. But sometimes you are on the run, or short on time, and you just want the quick insights and the nuggets of wisdom in an easy to understand format. We have heard your feedback and that’s why we created Email Reports! Email Reports will breakdown important metrics such as Unique Visitors, Conversions, or other important milestones you have set up through Behavior Tags. Below we will breakdown each section of a sample Lucky Orange Email Report. 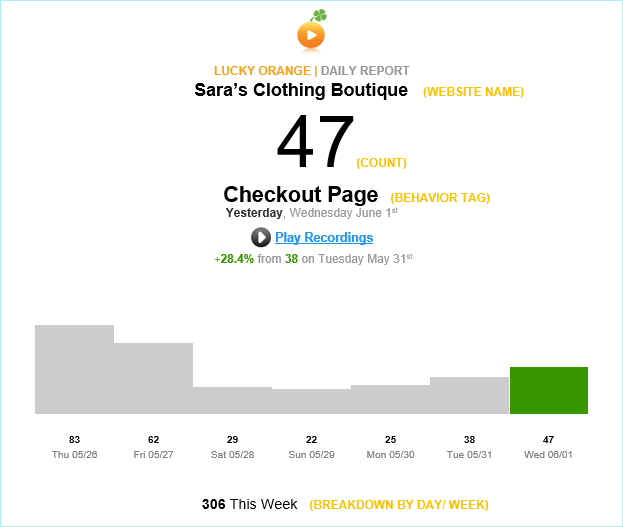 The Top Section will give you quick count of how many unique visitor came to your website, or how many of them triggered your desired Behavior Tag yesterday/ this week, and if it is up or down vs the previous period. You will also see the Tag name, in this case it is "check out," and a total count for each day of the week. Pro Tip: If you click the blue Play Recordings link, it will automatically take you into your dashboard and filter your Recordings to those visitors that triggered your behavior tag in that time period! 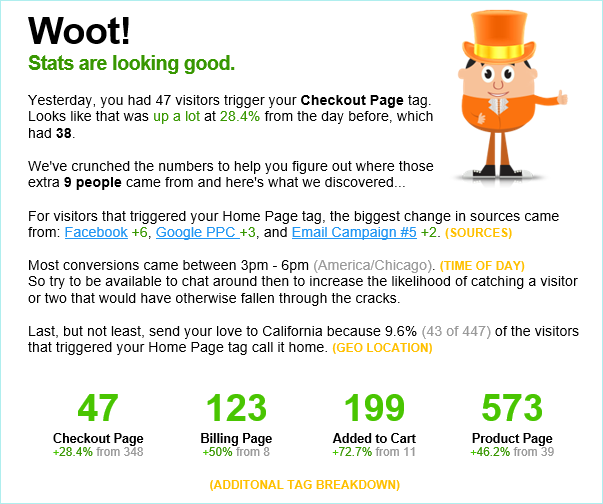 Always wanted to quickly see where most of your conversions are coming from? The middle section will break down where most of your converting traffic came from. 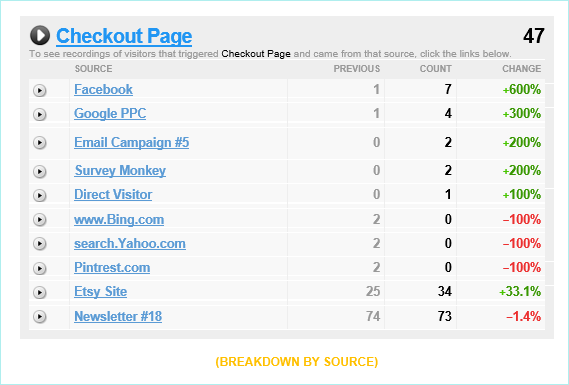 Below you can see the biggest change in the sources of where your converting traffic came from. The next two paragraphs will give you some great insights into the Time of the Day most conversions happened on your site, and the GEO Location of where your converting traffic "calls home." In addition to your "Conversion" behavior tag, you have the ability to see a breakdown of up to four additional tags, in the "Additional Tag Breakdown" section. The final section of the Email Report will highlight up to four additional Tags, and tell you the top sources that had the most change. The numbers in green indicate there is a positive change, while the numbers in red indicate traffic from that source has gone down. Both of which will have a percent change to help you easily see your biggest movers. Pro Tip: By clicking on any of the blue links in your email report, it will automatically filter your Recordings in your Lucky Orange dashboard, to visitors that came form that source. If you have not set up Email Reports yet, or want to customize your settings please see this help doc: How do I set up Email Reports?